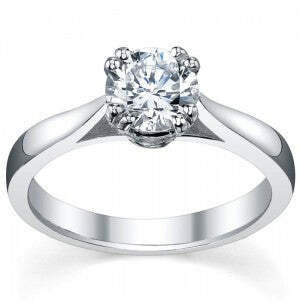 This solitaire setting sells for $445 in 14kt white gold. This setting sells for $3,775 in 14kt white gold. Here, at deBebians, we sell engagement rings from a couple hundred dollars all the way up to thousands of dollars. When I first begin to assist customers with their purchase, I always ask what their engagement ring budget is. Sometimes customers are a little hesitant to give a budget but this is truly very important and a necessary place to start. I try to gauge what the customer is looking for and then I offer my expert advice. For example, sometimes a customer wants to put the majority of their budget into a loose diamond and therefore I recommend getting the largest, best quality diamond and then setting the diamond into a solitaire setting. I let the customer know that they can either upgrade the setting at a later date if they want or they can purchase a wedding band with some diamonds to add a little bit more sparkle. Sometimes I have clients who spend about $4,000 on just the engagement setting only! This is when I gauge how much budget they have left and try to find the best diamond for their budget. Sometimes I even recommend colored stones such as sapphires and rubies as center stones. 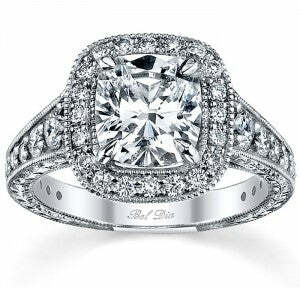 This is a great way to have an amazing engagement ring at a great price. No matter what your budget is, there is a ring out there for you! If you need professional guidance, please do not hesitate to contact us. We have three GIA gemologists on staff that are eager to help you find that perfect engagement ring!